Editor's note: Leroy Chiao is a former NASA astronaut and commander aboard the International Space Station. During his 15-year career, he flew four missions into space -- three on space shuttles and one as the co-pilot of a Russian Soyuz spacecraft to the ISS, where he served as the commander of a 6½-month mission. Chiao has performed six spacewalks and has logged nearly 230 days in space. The opinions expressed in this commentary are his. (CNN) -- It seems people only pay attention anymore when the rocket blows up. Just seconds into its launch Tuesday evening, the Orbital Sciences Antares rocket, carrying supplies to the International Space Station, suffered an explosion in the aft end of its first stage, fell back onto the launch pad and blew up in a spectacular fireball. Within minutes, the major news organizations had picked up the story and began running live interviews of eyewitnesses and experts. 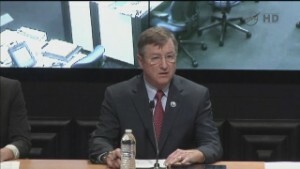 We learned of the experiments that were being transported to the ISS, including several student/school science projects. Had all gone as planned, the news of the launch would have earned scant mention, and certainly very few in the general public would have known anything about what was on board. 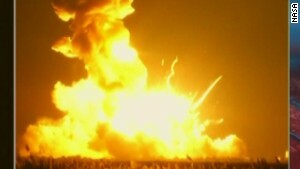 Orbital Sciences Antares rocket explodes at launch Tuesday in Virginia. Twenty years ago, I launched on my first space shuttle mission. At the time, the O.J. Simpson trial was under way, and I understand that at least one major TV news station, covering the launch live, waited until we had cleared the launch pad tower, then immediately relegated our ascent into a small corner of the screen in order to go back live to the trial. In a way, we are victims of our own success. People have gotten so used to successful flights that nothing gets their attention unless there is a mishap. And, maybe that's OK.
One day, spaceflight should advance to the point of being routine, not unlike air travel. We've come a long way since launching the early astronauts into space more than 50 years ago, but accidents like this serve as a reminder that spaceflight still should not be taken for granted. By their nature, rockets and rocket engines are unforgiving, containing complex components, which must work correctly to get into space. Although the Antares explosion was a significant mishap, we will get through this. The accident investigation team will determine the root cause. We will learn from it and build even more robust rockets in the future. The crew on board ISS do not face any immediate shortages, although the shortfall from this failure will have to be made up. Without a doubt, critics will arise and question why we are entrusting cargo deliveries and future crew exchanges to commercial companies. The answer is simple: It is the logical evolution of technology and commercialization, following the same path as the development of the airplane and commercial air transportation. There is plenty of government oversight of airline operations, as there is plenty of such oversight of commercial space operations through NASA and the FAA. This mishap is painful, but it is only a speed bump on the way to the commercialization of spaceflight. We will get there, and it will be soon. The opinions expressed in this commentary are solely those of Leroy Chiao.